I have a friend who is having a 21st birthday party this weekend (I’m excited that I still have such young friends!!) and I needed to make a card and a box for the present. I’ve still got the box to go, but I’m working tonight and need to have a sleep this afternoon, so I’ll be madly making one tomorrow!! Nothing like leaving it to the last minute!! I am definately loving the Elements of Style stamp set. I have cased this card from Tania Gould, and haven’t changed it much. It’s amazing how you can make a mistake work for you!! 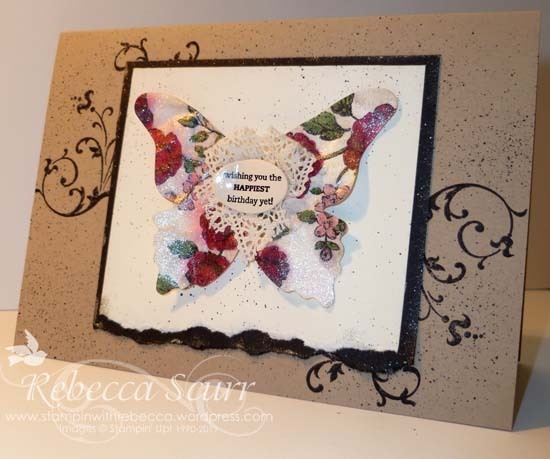 As I was putting the tape on the back of the very vanilla piece, when I turned it over, I had a black spot right in the middle of the top which wasn’t going to be hidden by the butterfly!!! So out comes the spritzer tool and the black marker and away we go!! You can get really carried away with spritzing if you’re not careful!! I also love bling so after colouring the butterfly, I drowned it in Champagne mist shimmer paint which has been mixed with Isocol. So much glitter, just beautiful!! Because the paper was a wee bit damp, I dried it with my heat tool and then scrunched it a bit. And then added such a bit more shimmer paint, this time with a sponge dauber. You really can’t have too much glitter!! Honestly!!! I have also rediscovered shrinky dink plastic. 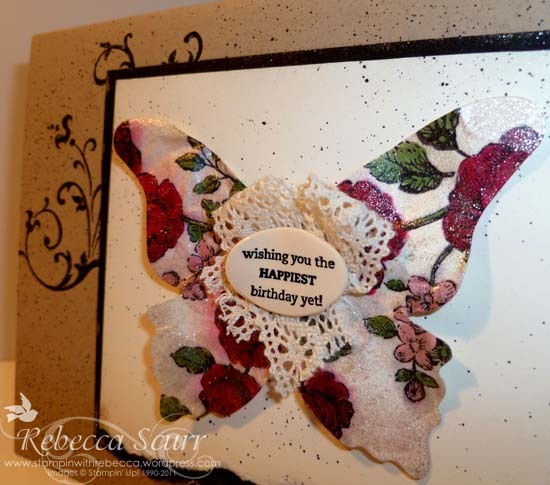 I couldn’t find a birthday greeting small enough for my punches so I used the large oval punch to punch out the greeting, which I had stamped with Staz-on ink and then heated it with my heat tool. It’s fun watching it melt and hoping it will end up flat!! I added a touch of lace as well. I hope you like it!! Can you see the glitter!! « 7 June 2011 – Challenge! !